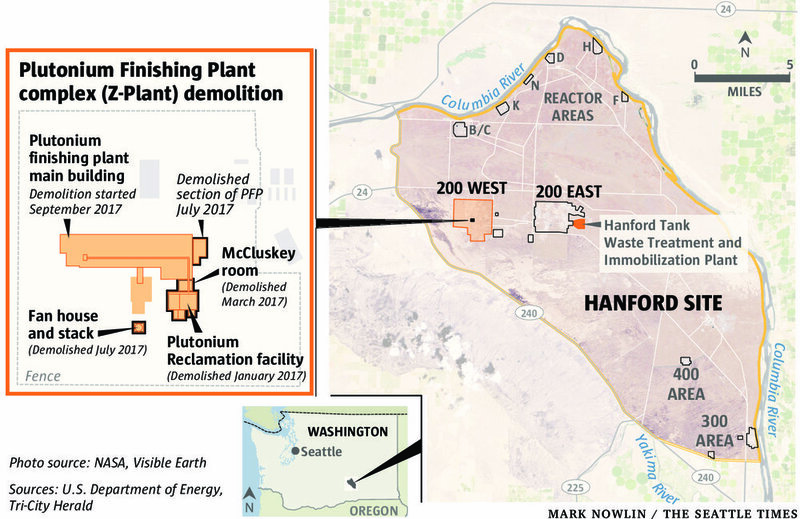 Demolition work at Hanford Plutonium Finishing Plant has been stopped because of concerns about spreading contamination. Seven homes off-site were surveyed, and more than 200 workers have requested testing. A government contractor has suspended demolition work at Hanford’s long-shuttered plutonium finishing plant after repeated incidents of contamination spreading from the job site in recent weeks, raising concerns among workers who might have been exposed to radioactive materials. Radioactive particles were detected on 14 vehicles, and as of Friday 257 workers had requested bioassay tests to determine whether they might have breathed in contamination. Seven homes have been surveyed, but no signs of contamination were found, according to a federal Energy Department timeline of events. In recent days, the major contractor on the job — CH2M Hill Plateau Remediation Co. — has scrambled to assess the scope of the problems, which likely were exacerbated by high winds that whipped through the site near the Tri-Cities last Sunday when the demolition work was halted. “Mistakes were made at several levels that created a situation that is unacceptable for worker safety, protection of the environment, and service to our customer,” said Ty Blackford, president of CH2M Hill Plateau Remediation Company, in a written statement. An Energy Department statement released Thursday said that contaminated areas were found, that they were covered with soil and a “fixative” and that no new contaminated sites were located during the day’s work. This kind of perspective is interesting and it invites arguments and debate for the other camp who do not want to use nuclear power. Several nuclear power plants in the United States are being shut down. The electricity they generate is being replaced by electricity from fossil fuel-fired power plants. The utilities say that their nuclear plants are more expensive to operate than their fossil-fueled plants operating on cheap coal and natural gas. The question has been asked, “Do we really need nuclear power?” The response has to be an unequivocal “yes!” Cheap fossil fuels won’t last forever. Nuclear power is the only source of electricity we have that has a plentiful fuel supply and is both “dispatchable” — that is, available whenever it is needed — and carbon-free. 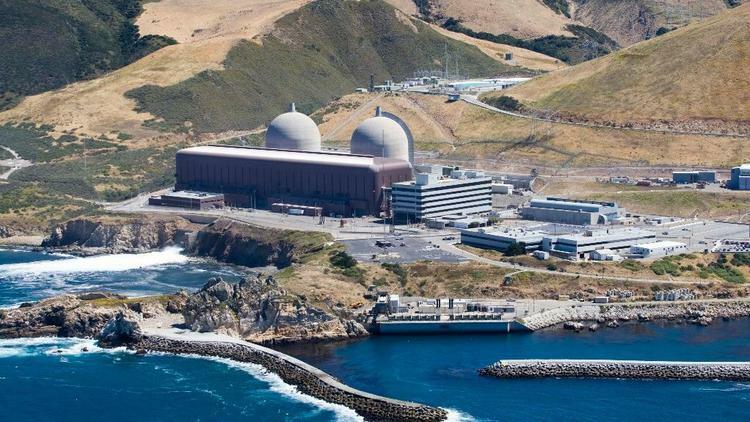 Related: Why nuclear power has no future in California or U.S.
Westinghouse miscalculated the time it would take, and the possible pitfalls involved, in rolling out its innovative AP1000 nuclear plants, according to a close examination by Reuters of the projects. The risks associated with the Indian Point Nuclear Plant in New York is tremendous which I highlighted in my research paper A Fukushima-Like Disaster in New York City and Possible Issues Associated with the Extreme Event Management System which was published on December 9, 2016. A month later, the decision to permanently shut down the plant was made. What a coincident? This following is the news published by the New York Times on January 9, 2017. The Indian Point nuclear power plant north of New York City has been supplying low-cost electricity to the metropolitan area for more than 50 years. But to hear Gov. Andrew M. Cuomo tell it, New Yorkers will hardly miss Indian Point. Mr. Cuomo announced on Monday that the state had reached an agreement with the plant’s operator, Entergy, to shut it down by April 2021. He minimized the effects the closure would have on the power grid, electric bills, workers and the regional economy.